Xavier Bougarel has reviewed my book The Bosnian Muslims in the Second World War for Southeast European and Black Sea Studies, but appears to have done so without reading it at all carefully. What follows is my correction of his misrepresentation of my work. Although I would have preferred to have published this correction in the journal in question, and although some academic journals (e.g. Slavic Review, Journal of Contemporary History) do permit authors to publish responses or corrections to book reviews, Southeast European and Black Sea Studies is not one of them. ‘Hoare draws artificial parallels between two movements [the Muslim autonomist movement and the Communist-led People’s Liberation Movement] that had very different characteristics and aims. He ignores the persistent anti-communist views of most members of the Muslim autonomy movement (especially the Muslim clerics). He speaks of a ‘dual Bosnian movement of resistance’ (9), whereas the history of the Muslim autonomy movement is chiefly the story of their collaboration with the Third Reich. He even makes the odd assertion that the SS Handschar Division was ‘the flagship project of the Muslim autonomist resistance’ (103) whose ‘ruling ideology shared some common ground with the multinational Bosnian patriotism of the Partisans’ (195). Bougarel here seems to be claiming that I have somehow glossed over the Muslim autonomists’ collaboration with the Third Reich, and presented them as some sort of anti-Nazi resistance movement. Yet this is the very opposite of what I actually did write. i) I wrote ‘Although the Muslim autonomists were not a resistance movement in the sense of being anti-fascist, anti-Nazi or anti-occupier – they were none of these – they were a resistance movement in the sense of being anti-Ustasha and anti-NDH’ (p. 10). They were a ‘specifically Bosnian anti-Ustasha (though not anti-fascist, anti-Nazi or anti-occupier) current of resistance, that paralleled and overlapped with the Communist-led People’s Liberation Movement (NOP)’ (p. 14). ii) I described the Muslim autonomist leader Uzeir-aga Hadzihasanovic as ‘the de facto leader of the pro-German but anti-Ustasha wing of the Muslim elite’ who ‘adopted a back-seat role in channelling Muslim autonomist opposition to the NDH’ (p. 41). iii) I discuss the efforts of Muslim autonomists ‘who were anti-Ustasha but nevertheless ready to collaborate with the occupiers’ (p. 40) to seek ‘direct German military administration over the whole of Bosnia-Hercegovina’ (pp. 40-41); the stated desire of Murat-beg Pasic, a Muslim autonomist notable from Bijeljina, to ‘fight for Bosnia-Hercegovina, albeit under German military protection’ (p. 44); and the attempts of Muslim autonomists in Hercegovina to ‘express the loyalty of the Muslims of Hercegovina to the Kingdom of Italy’ and seek ‘the establishment of an autonomous Bosnia-Hercegovina under Italian protection’ (p. 50). iv) I described in detail the Muslim Memorandum to Hitler of November 1942 as ‘the culmination of activity on the part of the pro-German, anti-Ustasha wing of the Muslim autonomist movement. Up until the summer and autumn of 1943, Muslim autonomist activity aimed predominantly at direct collaboration with the Germans to bypass the Ustashas, rather than at direct resistance activity.’ (p. 51). v) I cite the Memorandum’s enthusiastically pro-Hitler, anti-Semitic words addressed to ‘Our Führer !’: ‘Nobody, not a single ethnic group, not a single tribe, likewise not a single nation in all Europe has with greater devotion felt and understood your gigantic movement to establish a New Order in Europe as have we Bosnians, Muslims of Bosnia. We have in the principles of National Socialism, your movement, felt that it alone brings justice, order and peace to Europe, which has been blighted and ruined by democracy.’ (p. 52) I cite the Memorandum’s reference to the fact that ’the Jewish problem among us has finally been solved…’ (p. 52). vi) I describe the opposition of the leading Sarajevo Muslim autonomists Uzeir-aga Hadzihasanovic and Mehmed Handzic to collaboration with the NOP (p. 82); the fact that Handzic was the ‘most powerful opponent of both the Partisans and the Ustashas among the Muslim autonomists’ (pp. 247-248) and that the NOP may have assassinated him; the execution by the Partisans of the Tuzla Muslim autonomist leader Muhamed-aga Hadziefendic (p. 137); that Nesad Topcic, leader of the Muslim autonomist ‘Green Forces’, directed his activity primarily against the Partisans (p. 189) and was eventually killed by them (p. 257); that Tito considered Muslim autonomist leader Hafiz Muhamed efendi Pandza, with whom the Partisans collaborated, to have been ‘an agent of the Gestapo all along’ (p. 153); and the Partisans’ execution of Srebrenica Muslim autonomist Ismet Bektasevic after he abandoned them for the Ustashas (p. 143). vii) I describe the origins of the Handzar Division in the machinations of the Nazi leadership: ‘At Himmler’s suggestion, Hitler approved in February 1943 the establishment of an SS division made up of Bosnian Muslims. The Ustasha functionary Alija Suljak arrived in Tuzla at the end of the March 1943 with the goal of mobilising the Muslim population behind the formation of a Bosnian SS division… The name chosen for the Division was the 13th SS Volunteer Bosnian-Herzegovinian Division (Croatia)’, an attempt to reconcile the feelings of both its Croat and Muslim members. Yet it was more commonly known as the Handschar (Scimitar) Division’ (pp. 53-54). Regarding my supposedly ‘odd assertion’ of shared ideological ground between the Partisans and the command of the Handzar Division – this was demonstrated by evidence that Bougarel has not disputed. ‘[the Handzar Division’s] ruling ideology shared some common ground with the multinational Bosnian patriotism of the Partisans. [Its commander Karl-Gustav] Sauberzweig informed his troops “you all know that, in addition to the Muslims, Catholics and people of the [Serbian Orthodox] faith also call this their home. They must all be absorbed into the Bosnian community… We shall give the first liberated land to the Muslims, but we shall not permit the others to be left out. Please consider this and forget the petty hatreds, which only cause new discord.” (p. 195). This echoed the Partisan support for Bosnia-Hercegovina as the common homeland of Muslims, Serbs and Croats. Bougarel has not challenged the veracity of the passages in question, so it is not at all clear why he considers my assertion to be ‘odd’. Again, Bougarel’s claims that I a) ignore the Yugoslav dimension of the Partisan movement and b) ignore the role of the Yugoslav idea in mobilising Bosnian Serbs, are both directly contrary to what I actually wrote in the book. My actual position, as I elaborate in detail, is that both the Bosnian and Yugoslav dimensions are crucial to understanding the victory of the Partisan movements, but that the Bosnian dimension has been ignored by the traditional historiography. i) I describe how the Staff of the Partisan Group of Shock Battalions appealed to the Serbs and Muslims of East Bosnia with the slogan ‘Long live the people’s liberation struggle of all the peoples of Yugoslavia !’ (p. 25). ii) I describe the events of the First Session of the Antifascist Council for the People’s Liberation of Yugoslavia (AVNOJ), which ‘issued individual appeals to each of the Yugoslav nations, including the Muslims’, and promised the Serbs ‘a free and brotherly union of Serbia, Montenegro, Croatia, Slovenia, Bosnia-Hercegovina and Macedonia’ (p. 26). iii) Chapter 4 is entitled ‘Bosnian assembly and Yugoslav federation’ and largely devoted to the relationship between the Partisan state-building processes at the Yugoslav and Bosnian levels; I argue that ‘The Bosnian and Yugoslav state-building impulses therefore converged. In November 1943 the convening of the First Session of ZAVNOBiH [Country Antifascist Council for the People’s Liberation of Bosnia-Hercegovina] and the Second Session of AVNOJ, establishing a new Yugoslav state on a federal basis, within which Bosnia would be one of six equal units, set the seal on this process and paved the way for the foundation of a Bosnian state’ (p. 155). iv) I argue that the ‘laying of foundations of Bosnian statehood at this time [autumn 1943] was therefore the product simultaneously of specifically Bosnian, all-Yugoslav and international developments’ (p. 164). v) I cite the First Session of ZAVNOBiH’s declaration that Bosnia-Hercegovina would be ‘in the great democratic federal union of peoples of Yugoslavia an equal member with the other countries of Yugoslavia’ (p. 179). vi) I devote a subsection of Chapter 4 to the Second Session of AVNOJ (pp. 181-186), and another in Chapter 5 to the ‘Yugoslav Road to Bosnian statehood’ (pp. 200-203). I quote the KPJ Central Committee’s proclamation: ‘Peoples of Yugoslavia ! Serbs, Croats, Slovenes, Macedonians, Montenegrins and Muslims ! … Forward for a free Serbia, a free Croatia, a free Slovenia, a free Macedonia, a free Montenegro and a free Bosnia-Hercegovina in a free Democratic Federative Yugoslavia’ (p. 199). I argue that ‘The Bosnian and wider Yugoslav federal state-building processes ran parallel, each decisively influencing the other’ (p. 288). vii) I describe how, at the Third Session of ZAVNOBiH in April 1945, the third speech was delivered by Sinisa Stankovic, president of the (Partisan) People’s Assembly of Serbia, who stated: ‘At this moment, the enemies and traitors are spreading lies about the disintegration of Serbdom. To this it can be replied, that never in history has Serbdom been so united as it is today in the free union of equal Yugoslav peoples’ (p. 301). I could provide many more citations to refute Bougarel’s mischaracterisation of my book, but I will finish by noting his statement: ‘As Hoare himself notes, the region of Cazinska Krajina was long dependent on the Communist Party of Croatia, the Partisans of Vojvodina fought in Eastern Bosnia and the Bosnian units took part in the ultimate liberation of Serbia and Croatia.’ I do indeed note this, for the very simple reason that my book explores in detail the relationship of the Partisan movement in Bosnia-Hercegovina with the Partisan movement in the rest of Yugoslavia. Bougarel has used my actual position to argue against a straw-man position that he has falsely attributed to me. iv) Statement of Vojo Ljujic, Secretary of the People’s Front of Sarajevo, October 1946: ‘According to the statutes of the Federal constitution, the People’s Republic of Bosnia-Hercegovina has its own Constitution, People’s Assembly and its own government, which in fact guarantees its sovereignty. Nobody gave this to us, nor has it even been given to us in history. Our history is full of difficult pages of slavery under Hungary, Turkey and Austria-Hungary. It is the history of colonial exploitation of slaves and peasants; the exploitation of the riches of our country, mines, forests, cattle and – most importantly – the human workforce. But it is also the history of a people that has always fought for its freedom, justice and statehood.’ And: ‘In the struggle for survival, once again in all its strength was born the aspiration for freedom and for the independent statehood of Bosnia-Hercegovina, and this aspiration our people carried and developed through the struggle, establishing at once a granite foundation for its achievement. Nobody has given us the freedom we have today, nor has anyone given us our statehood. We achieved it in struggle and it is ours’ (p. 312). Bougarel has simply ignored the enormous quantity of documentary proof that I provided in my book, showing that the Partisans did indeed seek to establish a Bosnian nation-state, despite not formally recognising a Bosnian nation. Of course, such a project was paradoxical and problematic, but this is something I emphasised myself: ‘This was, in essence, a nation-state represented by a sovereign “National” or “People’s” assembly, in the tradition established by the French Revolution, a tradition to which new nation-states in Europe had tended to subscribe. There was, however, a tension between the “political nation” or “people” of Bosnia-Hercegovina and the five “nations” recognised by the FNRJ Constitution – the Serbs, Croats, Slovenes, Macedonians and Montenegrins. This tension was never resolved during the lifetime of the Yugoslav state and was formally the issue over which the war of 1992-95 broke out”.’ (p. 330). Bougarel is free to insist there cannot be a nation-state without a nation, but he should direct his criticisms at those who attempted to establish one (Tito and his Communists), not try to shoot the messenger (me). It is with some hesitation that I comment on the exchange between Noam Chomsky and Ian Williams over the question of responsibility for the bloodshed in Kosova in the late 1990s. Chomsky has no expertise and nothing interesting to say on the topic of the former Yugoslavia, and it is only because of his status as the world’s no. 1 ‘anti-imperialist’ guru that his utterances on the topic attract as many responses as they do. Chomsky epitomises the ‘anti-imperialist’ ideologue who believes in two things: 1) that the US is to blame for everything; and 2) that everything the US does is bad. If you share this worldview, then nothing said by Chomsky’s critics, such as Williams or Oliver Kamm, is going to convince you that he may be wrong on Kosova. If, on the other hand, you do not share this worldview, and are not star-struck by the celebrity Chomsky, then his rambling comparisons between the Western response over Kosova and the Western response over East Timor can only appear extremely tortuous and boring. It is tiresome yet again to point out, for example, the absolute falsehood of Chomsky’s claim that ‘the crimes in East Timor at the same time’ as the Kosovo war ‘were far worse than anything reported in Kosovo prior to the NATO bombing’ – it simply isn’t true. I am using Chomsky, therefore, only to open a discussion on the question of genocidal causality, and the insidious nature of the sophistry employed by Chomsky and his ‘anti-imperialist’ comrades: that Serbian ethnic-cleansing in Kosova occurred in response to the NATO bombing and was therefore NATO’s fault. As Chomsky put it: ‘The NATO bombing did not end the atrocities but rather precipitated by far the worst of them, as had been anticipated by the NATO command and the White House.’ The thrust of Chomsky’s argument is that since NATO commanders predicted that the NATO bombing would lead to a massive escalation of Serbian attacks on the Kosova Albanian civilian population, and since this prediction was borne out, then NATO is responsible for having cold-bloodedly caused the atrocities that occurred after the bombing started. 1) Chomsky claims that the bombing precipitated ‘by far the worst’ of the atrocities, but what precipitated the bombing ? The answer is that the NATO bombing of Serbia in March 1999 was precipitated by Belgrade’s rejection of the Rambouillet Accords. Belgrade was aware that rejecting the Rambouillet Accords would precipitate Serbia being bombed by NATO, but rejected them nevertheless. By Chomsky’s own logic, therefore, Serbia’s own actions precipitated the NATO bombings, and were consequently responsible for those bombings. Since, according to Chomsky, the bombings led to the atrocities, that means that Serbia was responsible for the atrocities after all. What Chomsky would like us to believe, is that if a US or NATO action produced a predictable Serbian response, then the response was the fault of the US/NATO. But if, on the other hand, a Serbian action produced a predictable US/NATO response, then the response was still the fault of the US/NATO. This is self-evidently a case of double standards. 2) Chomsky claims that the bombing precipitated ‘by far the worst’ of the atrocities, but what would have been precipitated by a failure to bomb ? The government forces intensified their offensive throughout July and August , despite promises from Milosevic that it had stopped. By mid-August, the government had retaken much of the territory that had been held by the KLA, including their stronghold of Malisevo. Unable to protect the civilian population, the KLA retreated into Drenica and some pockets in the West. Some of the worst atrocities to date occurred in late September, as the government’s offensive was coming to an end. On September 26, eighteen members of an extended family, mostly women, children, and elderly, were killed near the village of Donje Obrinje by men believed to be with the Serbian special police. Many of the victims had been shot in the head and showed signs of bodily mutilation. On the same day, thirteen ethnic Albanian men were executed in the nearby village of Golubovac by government forces. One man survived and was subsequently taken out of the country by the international agencies in Kosovo. The government offensive was an apparent attempt to crush civilian support for the rebels. Government forces attacked civilians, systematically destroyed towns, and forced thousands of people to flee their homes. One attack in August near Senik killed seventeen civilians who were hiding in the woods. The police were seen looting homes, destroying already abandoned villages, burning crops, and killing farm animals. (Contrary to what Chomsky says, the number killed in Kosova prior to the start of the NATO bombing was greater than the number of East Timorese civilians killed by the Indonesians and their proxies during the whole of 1999). Chomsky is saying that if – instead of presenting an ultimatum to Belgrade at Rambouillet and then proceeding to bomb Serbia when Belgrade defied that ultimatum – the NATO powers had given Belgrade a free hand in Kosova, then Serbian repression in Kosova would simply have continued at what he considers to be an acceptable level. Of course, there is no way of proving one way or the other what would have happened in Kosova if NATO hadn’t gone to war in the spring of 1999, but given the catalogue of horrors in the former Yugoslavia that were demonstrably not ‘precipitated’ by Western military intervention – the destruction of Vukovar, the siege of Sarajevo, the Srebrenica massacre, the killing of at least 100,000 Bosnians, the ethnic-cleansing of 300,000 Kosovars, etc. – the evidence suggests that it would not have resembled Edward Said’s ‘Sunday school picnic’. 3) Chomsky claims that the bombing precipitated ‘by far the worst’ of the atrocities, but even if this were true, would this make those atrocities NATO’s fault ? Genocides are invariably ‘precipitated’ by something or other. The Armenian Genocide was ‘precipitated’ by the outbreak of World War I and Tsarist Russia’s military advance into Anatolia. The Rwandan Genocide was ‘precipitated’ by the Rwandan Patriotic Front’s offensive against the Rwandan Army, the Arusha Accords and by the shooting down of the plane carrying Rwanda’s President Juvenal Habyarimana. Of course, it is entirely legitimate for historians to interpret instances of genocide as having been ‘precipitated’ by something or other, but anyone who uses such explanations to shift the responsibility away from the perpetrators – whether Ottoman, Hutu, German, Serbian or other – is simply an apologist or a denier. Hitler therefore made it explicit that the outbreak of a world war would result in the extermination of the Jews in Europe. Indeed, the outbreak and course of World War II ‘precipitated’ the Holocaust. Britain and France, when they declared war on Germany in September 1939, were by Chomsky’s logic responsible for the Holocaust. Some ‘anti-imperialists’ have, in fact, attempted to make this very point. In sum, Chomsky’s case is a disgrace at the level of plain reasoning, never mind at the level of ethics. Let there be no mistake about this: atrocities, ethnic cleansing and genocide are the responsibility of those who commit them. Whatever ‘precipitates’ them, they are the fault of their perpetrators. And it would be a sorry world indeed if were were to allow perpetrators to deter us from taking action to stop atrocities, ethnic cleansing and genocide, by their threat to commit still worse crimes in the event that we do take action. 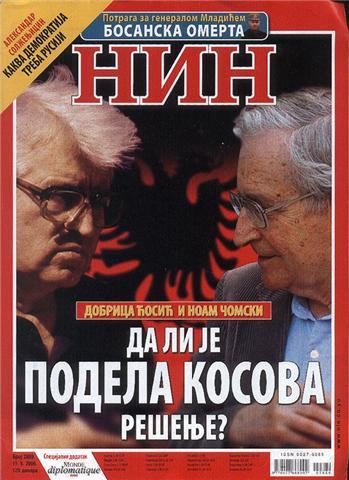 Image: Chomsky agreeing with Dobrica Cosic, the leading ideological architect of the Wars of Yugoslav Succession, on the need to partition Kosova – as reported by the Serbian magazine NIN. Hat tip: Andras Riedlmayer, Daniel of Srebrenica Genocide Blog. One of the most insidious things about the radical left-wing discourse of class warfare and imperialism is the way in which it is increasingly providing a cover under which the worst forms of bigotry, even murderous or genocidal bigotry, can masquerade as something ‘progressive’. So effective is this propaganda technique that today it is increasingly being adopted by members of the right and far right as well. Indeed, right-wing and left-wing opponents of our contemporary, cosmopolitan, global civilisation are increasingly resembling each other, dressing up anti-Semitism and other forms of racism as resistance to imperialism or capitalism. But even less crude opponents of immigration are ready to play the class-warfare card. In the words of Jeff Randall, writing a couple of years ago in the Daily Telegraph: ‘By lowering wages, migrants enable the middle classes to hire more home-caterers, dog-walkers, house-cleaners and hedge-trimmers for less cost than before. Very nice, if you’re an investment banker in Kensington. Not so hot, if the last job you had was polishing his Bentley.’ Of course, working-class families might also benefit from Polish plumbers charging less than British plumbers, but this particular Telegraph columnist has learned the value of dressing up his right-wing viewpoint in quasi-Marxist clothes. The problem is not that the language of the left is being cynically misused by racists and right-wingers, but that the links between left-wing discourse of ‘class warfare’ and ‘anti-imperialism’ on the one hand, and racism and anti-Semitism on the other, are much deeper than leftists are often ready to admit. When Ukrainian peasants rebelled against their Polish aristocratic landlords in 1648, their ‘class warfare’ was directed in particular against the landlords’ Jewish estate-managers; in practice against Jews in general, tens of thousands of whom were slaughtered. I hope it is unnecessary to point out that anti-Semitic slaughter of this kind does not become acceptable simply because it is an expression of ‘class struggle’. For modern socialists and anarchists, hostility to capitalism frequently went hand in hand with hostility to Jews, as evidenced by the anti-Semitism of Proudhon, Fourier, Bakunin and others, including Marx himself. Fascism itself had radical socialist origins, as the brilliant historian of fascism Zeev Sternhell has demonstrated. Early fascists replaced the class struggle with the national struggle as the weapon for attacking liberalism and democracy; they believed redistribution of wealth and power should occur between nations, rather than – or in addition to – between social classes. The most radical ‘national socialist’ experiment was, of course the one undertaken by Hitler and the National Socialist German Workers Party. As Hitler said: ‘We are socialists, we are enemies of today’s capitalistic economic system for the exploitation of the economically weak, with its unfair salaries, with its unseemly evaluation of a human being according to wealth and property instead of responsibility and performance, and we are all determined to destroy this system under all conditions.’ Hitler saw the task of his National Socialists as freeing the German workers from the influence of ‘Jewish’ international socialism, and of freeing the German economy from the control of ‘Jewish’ international capital. In power, the Nazis expropriated the wealth of Jews and of other nations, redistributing it in favour of Germany and German ‘Aryans’. Left-wing radicals, unrestrained by any belief in the virtues of moderation and restraint, will frequently slip down the slope from aggressive radicalism into outright chauvinistic hatred, with their radical ideology simply a means by which their inner rage against particular groups of people can find socially acceptable expression. And in recent years, the more the prospect of revolutionary social change in the direction of socialism has receded in the advanced capitalist world, the more radical leftists and their fellow travellers have been ready to descend into the gutter of chauvinism directed against ‘counter-revolutionary nations’. During the Wars of Yugoslav Succession of the 1990s, a considerable portion of left-wing opinion in the West made it abundantly clear that it did not respect the right of ‘counter-revolutionary nations’ such as the Croats, Bosnian Muslims and Kosovo Albanians even to exist, let alone to receive solidarity in their struggles for national survival. The genocidal campaigns of the regime of Slobodan Milosevic were invested with an ‘anti-imperialist’ content, so had to be defended against ‘Western media bias’ and ‘demonisation’. What was chilling at the time was that, once the nations in question had been marked as ‘pro-imperialist’, their only legitimate option – as far as the ‘anti-imperialists’ were concerned – was to lie down and die. Any attempt at resistance to their national destruction on their part was condemned as a crime equivalent to – indeed worse than – the original Serbian assault on them, while any expression of solidarity for them by others in the West was condemned as ‘support for Western intervention’. The Western leftists who defended Milosevic’s genocidal campaigns internalised the Serb-nationalist ethnic stereotypes of Croats as ‘Ustashas’, Bosnian Muslims as ‘fundamentalists’ and Kosovo Albanians as ‘criminals and drug smugglers’. There were plenty of ironies in the sort of arguments used to deny the right of these peoples to national existence. Opportunistic anti-Semitic statements made by Croatian president Franjo Tudjman in his book Wastelands of Historical Truth were cited to tar the entire Croat nation with the brush of fascism by leftists who have consistently turned a blind eye to – if not actively apologised for – the far more extreme and integral anti-Semitism of groups such as Hamas and Hezbollah or of the Iranian and other Muslim regimes. The Bosnian president Alija Izetbegovic, who never expressed any chauvinism toward Christians or Jews and who presided over a secular state, was condemned as a reactionary Muslim by leftists who would soon be supporting ‘resistance’ to ‘imperialism’ and ‘Zionism’ in Israel, Palestine, Iraq and Afghanistan on the part of genuine murderous Islamists, or uniting with British Islamists to form the ‘Respect’ party. Leftist stereotyping of Kosovo Albanians as drug smugglers and criminals is simply the same stereotyping as that employed by the BNP against Albanians and other immigrants or ethnic minorities. Thus, the Socialist Unity website cited popular left-wing blogger ‘Splintered Sunrise’ to back up its own opposition to Kosovo’s independence, quoting him as saying ‘I’m opposed to independence for Kosovo because the place is run by a bunch of mafiosi, its economy is based on the trafficking of drugs, arms and women, and giving this basket case the attributes of statehood will make a bad situation worse.’ The BNP, too, opposes Kosovo’s independence on similar grounds, arguing ‘Albanians are spread all over Europe and especially in the criminal underworld. They are notorious for their effectiveness, unpredictability and incredible cruelty. Their main advantage to the other organized crime [sic] is the fact that they speak language [sic] nobody understands, their organization is based on family ties and if someone dares to speak out that person is being brutally murdered. In Europe, today the Albanian mafia is the main engine of traffic of drugs and humans, theft and falsification of passports, weapons and human organs trade, abductions, extortions and executions. In London these people control the entire network of prostitution, in Italy and Greece they deal with weapons and drugs’ smuggling. There are entire towns in Italy where the business is controlled by Albanians.’ However, ‘Splintered Sunrise’ attributed the BNP’s support for Serbia over Kosovo not to anti-Albanian racism, but to the Albanians’ own alleged sins: ‘the new BNP position has its roots in Londoners’ fear and loathing of violent Albanian gangsters’. What is horrifying is not that the leftists in question are accusing Croatian, Bosnian and Kosovar leaders of things they are often not guilty of, or that the leftists in question are inconsistent or hypocritical. It is that such accusations are simply so many pretexts to support the destruction of the nations in question. These leftists do not want to give solidarity to progressive Croats who oppose anti-Semitism, or progressive Bosnian Muslims who support secularism, or progressive Albanians who oppose organised crime, with the goal of making Croatia, Bosnia and Kosovo better places. On the contrary, the leftists are seeking to provide ammunition to those who would like to wipe these countries off the map altogether. But for all the venom directed by ‘anti-imperialist’ leftists at the successor states of the former Yugoslavia, there is one state that they hate even more. Israel, in their eyes, is the ‘counter-revolutionary nation’ par excellence; its Jewish majority citizens condemned as ‘settlers’ (unlike immigrants in the West, who are not so condemned); its academics boycotted. Such leftists will line up with the most murderous and bigoted elements in the Muslim world against even the most progressive nationally conscious Jews on an ‘anti-Zionist’ basis; their need to deny Israel’s legitimacy as a nation and state trumping any opposition to anti-Semitism, fundamentalism, misogyny or homophobia they might be expected to have. Once again, they oppose Israel’s settlement building in the West Bank or discrimination against its Arab citizens not because they wish to align themselves with progressive Israelis who also oppose these things, but because they would, fundamentally, like to see Israel destroyed altogether. The pretext for this left-wing hatred of Israel is that it is a ‘hijack state’ based upon the dispossession of most of the Palestinians who lived there until the 1940s. But this ignores the fact that other states are based upon similar or even larger-scale dispossessions of national groups, without their right to exist being called into question. For example, the Czech Republic’s relative ethnic homogeneity stems from the Czechs’ expulsion, following World War II, of two and a half million ethnic Germans from what was then Czechoslovakia. Likewise, modern Turkey is founded upon the extermination of a million Armenians and hundreds of thousands of Greeks during the 1910s and 1920s, and the expulsion and dispossession of hundreds of thousands more. But nobody claims the Czech Republic or Turkey is an illegitimate nation-state. It is Israel alone which is deemed to have forfeited its legitimacy as a nation on account of its leaders’ crimes of decades ago. In each of the examples presented here, extremists try to dress up their bigoted hatred of whole ethnic groups or nations in radically progressive clothes. So the BNP will present its hatred of immigrants in terms of ‘supporting the British working class’, and radical leftists justify their hatred of ‘counter-revolutionary nations’ on the basis of ‘anti-imperialism’. Chauvinistic hatred does not become progressive simply because it is dressed in progressive clothes, and it is always worth looking beyond the window dressing to see what the agendas of such groups and individuals really are. Equally, it is time to acknowledge the problematic nature of such radical left-wing concepts as ‘class warfare’ and ‘anti-imperialism’, and the reasons they lend themselves so readily to abuse. When they are increasingly becoming the justification for the most extreme reactionary politics, something is very wrong. This article was published on 10 August by Engage.